Third generation knifemaker Logan Pearce is making a name for himself with a wide range of knives, from exotic art knives to traditional Bowies. 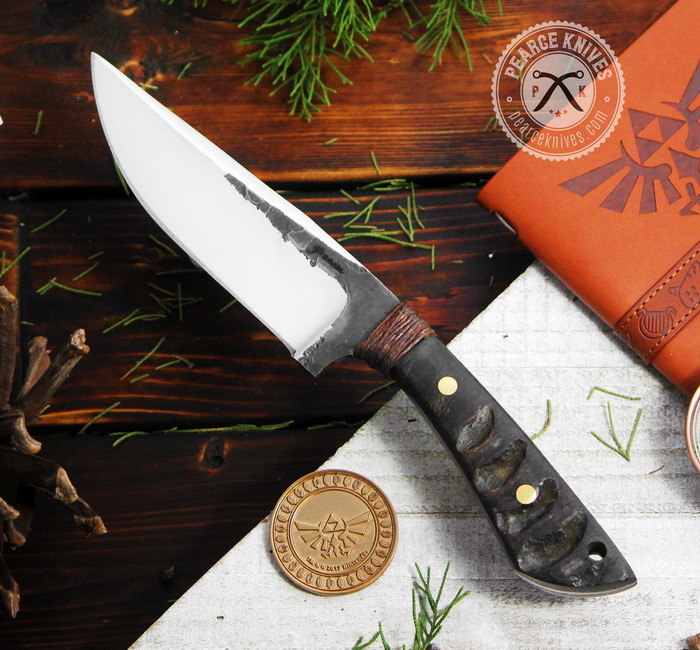 This rustic Pocket Bowie has a 6-inch blade forged from 1080 high carbon steel. The handle is African Blackwood. Logan Pearce is a third generation knifemaker. He was taught how to make knives by his grandfather, Perry Pearce. Perry Pearce made knives for over 25 years. He specialized in making knives out of everyday objects like wrenches, rebar, and mainly railroad spikes. Perry was widely known for making railroad spike knives. In 1993 it was named the Silver Spike and put on the front cover of Edge Catalog. After Perry Pearce passed away, Logan continued on the work of his grandfather, even though the rest of his family decided to no longer make knives. Logan forges all of his knives out in the traditional manner of heating up the metal to high temperatures in a coal fire or gas forge and beating them into shape with a hammer. Logan continues to sell the railroad spike knives all over the world. The railroad spike knives are carried in over half a dozen catalogs, multiple railroad shoppes, and knife dealers. Some of the most notable are Schrader’s Railroad Catalog and the world’s largest scenic railroad; White Pass & Yukon Route in Alaska. While, Logan does plan on making the knives that his grandfather made, he also wants to make his own style of knives. He does his best to better his skills every day in hopes of becoming a great bladesmith and one day a Master Bladesmith.